An attention gaining and motivating sign begins with great planning. Through our years of experience in the signage business, we’ve learned a thing or two about making great signs. 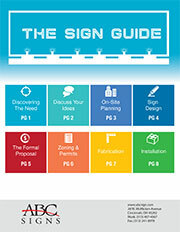 Browse this section to learn more about the art of developing the perfect sign to meet your business goals, needs, and budget. Your great sign begins here! Once you are ready to get started give us a call. The experts at the ABC Signs sign company will assist you in developing a design or in bringing your design plan to reality! Communicate your message effectively to your Greater Cincinnati and Northern Kentucky audience with ABC Signs. Please call (513) 407-4367 or email us today!